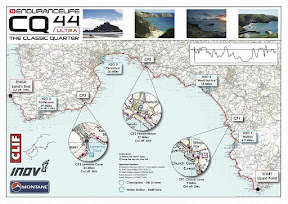 Ultra Running Matelot: Classic Quarter 44 2016 - Beauty and the Beast's love child! Classic Quarter 44 2016 - Beauty and the Beast's love child! Trying to think of an appropriate title to describe the event and the blog proved to be harder than I first thought. Many variations went through my tiny mind until I decided to stick with the one I have now. I think it pretty much sums it up because if Beauty did make a child with the Beast I think this is what it would be like but obviously in a running route way. Since Hope24 just about a month, I took all the positives from that event and used towards my plan on how I was going to run the Classic Quarter. Knowing I was able to cover the distance and in the time frame was no problem, it was just the added pressure of cut off's that always bugs me. As I lose a lot of time on the climbs, I knew I had to make sure I made up the time elsewhere. 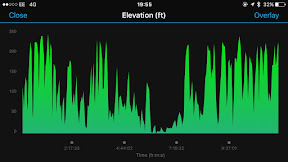 I'm still trying to improve my pace on the climbs but until then, I had to do made best elsewhere and with the help of my wife crewing me I knew she was going to make a big difference. In the lead up to the event, I got more nervous about the cut off's especially with the fantastic hot weather we were experience knowing that the heat could be a major factor. However the forecast kept changing saying it was going to be nice, then raining, then overcast etc. It didn't know what it was going to do. I planned the points the wife was going to meet me along the route and we spoke about my plan of attack. The only thing left to do was run. Friday evening we arrive down the Lizard straight after work to pick up the race number. It was nice to catch up briefly with a few friendly faces, Mark Evans a centurion grand slam buckle owner, Duane Roberts of Team Buff UK, good friend Stuart Queen (who was apart of the race crew)a few local faces of Sharon Smith, Gary Richards (winner of this years Hope24) amongst others. With the fog closed in on the Lizard and the sound of the lighthouse fog horn going off, the weather conditions for me were looking perfect. I just was hoping it would last. Staying at my parents place in Redruth meant we had an early start, luckily leaving my son with my Mum for the day meant my wife only had me to concentrate on. We arrived back down at Lizard Point, and the atmosphere of the start was building as we made our way down to the start line ready for the race brief. There was a buzz of a drone roving round filming, I saw more faces I knew the likes of David Andrewartha, Sharon Sullivan, Paul Reeve and Phil Bolt. All of us wishing each other good luck for the race. Eventually with the race briefing done about 0636 we mass started, the soloists first followed an hour later by the relay runners. 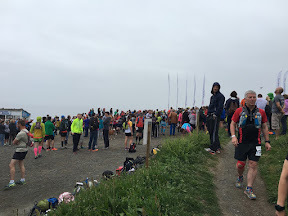 The start was packed as you could imagine with 265 runners making their way down the narrow coastal path, making it difficult to make any good progress until after the first couple of miles. 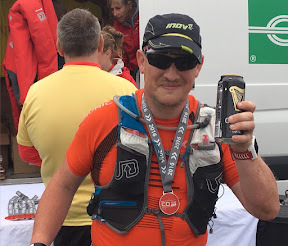 With the first cut off at the 9 mile point CP1 it was important to get a good head start. To assist my wife I set up the Race Drone app tracker so she could hopefully keep an eye on my progress and have some idea where I was. 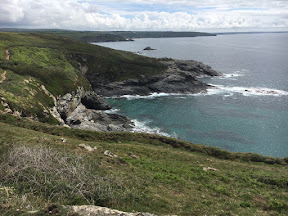 However knowing this was the Cornish Coastal path I knew it wasn't going to be as good as proper tracker due to the lack of phone GPS signal. The weather at this point was cool and over cast, and I made good progress, and I was feeling good on the climbs that I already come across so far. The wife appeared before CP1 and we swapped my bottles. To save time having to fill my water up at the aid stations my wife had spare bottles and it was a case of one for one. Also having a bladder in my pack full of Tailwind Nutrition, I knew that was going to last me the whole race. I arrived at CP1 with over an hour spare of the first cut off of 3 hrs. This was great as it meant I had 4 hours then at the maximum to get to the half way point CP2 at 22 miles. Around the 10 mile point is where it all started to unravel for me. The sun came out, the clouds disappeared and the heat turned up to around 20 degrees. With no shade, my pace fell away I couldn't sip on my fluid quick enough. My body was cool enough thanks to the great X-Bionic kit I had but I couldn't keep my head cool enough. I went through Porthleven as quick as I could saying hello to a good friend Loyd Purvis (winner of this years Enduroman 50) and continued on. It didn't matter what I was trying I was suffering badly from heat exhaustion rapidly. I still moved forwards but each mile was getting harder and with the climbs added in, I was slowly losing time. 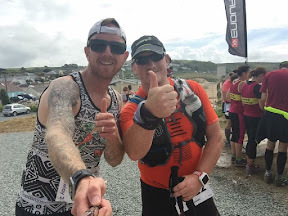 I got to 19 miles at Praa Sands and again got supplied by my wife, who already had been assisting other runners who were struggling at that point. I informed her it was not going well for me, and I said against our plan I wanted to see her at the halfway point of 22 miles. I stopped at the kit check stop managed to go through the mandatory kit check and went on. Not with out having a selfie being taken with a new friend Andrew Phillips. He was running in the relay but doing the second half so was out supporting. 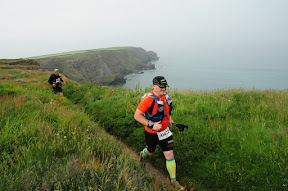 As I wobbled in to the half way in a daze, I dibbed in after 3hrs and 20 odd mins since CP1. 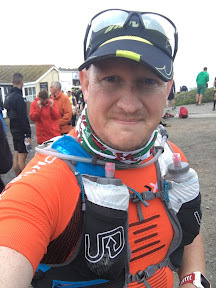 The marshal asked if I had a drop bag to which I managed to get out "No, I have a wife" I was told to move on to which I then went an almost collapse in a heap. Luckily my wife came and found me and dealt with me as no event staff checked up on my well being at this point. I was ready to retire from the race, however the wife picked me up dusted me off and kicked me out of the half way. I got to 24 miles where the I had planned originally to meet the wife, so I could change my shoes to road ones as I was starting a stint from Marazion to Mousehole which the majority was tarmac. As planned the wife was there, she quickly whipped of my trail shoes and socks and shoved fresh socks and my road shoes on. She also handed me a Callipo ice lolly and kicked me on my way again. The clouds came over and soon enough it was like I had a second wind, with the Callipo in my hand I started knocking off the miles and I felt good. 29 miles soon came and I had a quick bottle change before heading into Mousehole. I made up a lot of time and clawed back the time I lost at CP2 and prior to that. With the plan to revert back to trail shoes at Mousehole, I decided against it. I knocked back a quick cup of flat coke from the wife and cracked on. I got to Lamorna CP3 in just under 3 hrs again from CP2 under the cut off time of 9 hrs by 43 minutes. I knew those 43 minutes were going to be needed as the next 6 miles was going to be the toughest section of the race. I wasn't wrong and to add to it the sun and heat had come out to play once more. Again it knocked me for six, making for me what was already a hard section even harder. 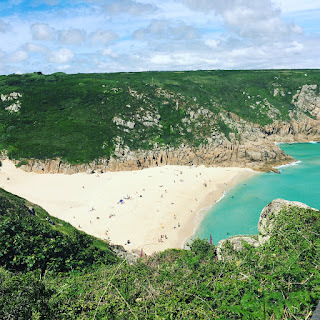 My mind was starting to weaken and knowing I had to get the Minack Theatre (Porthcurno) with in the cut off time. Although not a CP but a water station you still had 3 hrs from CP3 to make it in. After climbing the steps eventually crawling into the water station I had made the cut off and was met by the wife and friend Laura Millward, who gave me a hug and told me to get on with it. I quickly changed by bottles which now was ice cold and was given my 4th or 5th Callipo by now. I moved on foot in front of another, running when I could and walking the hills. I finally had some company for the last stretch of 5 miles with a guy called Fred who was running his first Ultra. We chatted as we went along, and the final miles fell away. It had cooled down now as well as it became over cast once more. Soon enough we saw the last mile sign and the sense of relief had left me as we made our way to the finish at Land's End knowing we'd be finishing within the final cut off time. I ran in to cheers from my parents, my son who ran the last bit with me, one of my best friends Craig who waited around for me to finish after all his club members had long finished and gone home as well as all the other supporters at the finish. 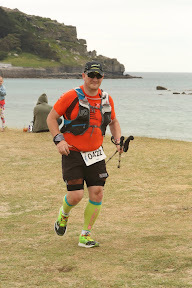 I completed the last 11 miles including the 6 really tough miles from Lamorna to Minack in 3 and half hours. This meant I finished the whole event 2 hours under the finish cut off in 11 hours 57 minutes 5 seconds. If it wasn't for the heat I was looking good for around 10 and half hours but I'm not disappointed, apart from the heat which was out of my control my plan worked well and obviously having a great crewie that is my wife who knows me so well by now, she was all over it like a well oiled machine. 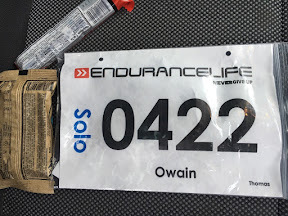 As an Endurancelife event goes, it was what is was. I was fully aware of what I was getting for my money prior to entering. I entered for the route and course really nothing more than that. It's a good training event for next years epic adventure. What did surprise me and made my event was the support along the way, it was fantastic! Not only did I run along such a stunning route, which looked like I could be in the Med when the sun was out, the support was brilliant. At one point there was a little cottage in a cove where the old couple was bringing out glasses of cold water for the runners. I couldn't tell you how limited the CP's or Water stations really were as I never used them, but at a glance they lived up to what they said in the race brief and race information. The kit I used was X-Bionic " The Trick" Top and Shorts, X-Socks marathon socks, Ultimate Direction AK 3.0 Mountain pack, Sunwise "Odyssey" and "Canary Wharf" Sunglasses (I didn't have time to change the lenses from yellow to dark on the Odyssey so it was easier to change glasses), Tailwind Nutrition (Tropical Flavour), Hoka Challenger 2 Shoes (trail) and Saucony Kinvara 7 shoes (Road). I don't regret any choice of kit and all worked well to help me achieve my goal. So where does this leave me? 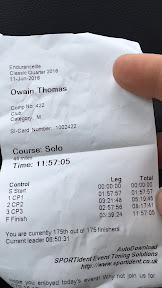 Well there is still a lot I need to improve on especially getting quicker on the climbs and my over pace, however this is one of my better performances and I hope to improve on it. I came away with only a couple of tiny blisters which compared to Hope24's performance it's a world apart. I need to thank my sponsors X-Bionic UK/X-Socks UK and Sunwise for the fantastic kit they provide me. I know for a fact I'm able to achieve what I do with the kit they provide. Now to continue with training and focusing on the areas I need to improve on. Until next time!